Relieves general body aches and pains. Himalaya Herbals Pain Massage Oil contains Sweet Flag, nature's best pain relieving agent, and Ginger and Horseradish Tree that have refreshing and anti-inflammatory properties. Combined with Country Mallow, an effective pain reliever, these herbs provide lasting relief from general body aches and pains. 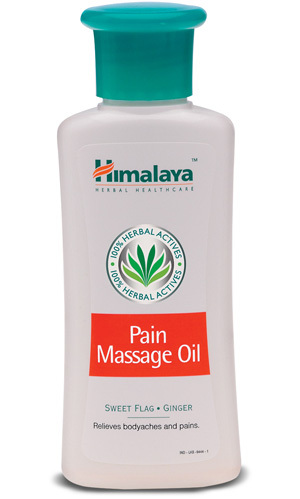 Apply Himalaya Herbals Pain Massage Oil over the affected area and gently massage if necessary. Follow with a warm shower.